Change is afoot at the Greenbank Hotel with a new head chef at the helm for the launch of its revamped restaurant on Friday (May 1). Award-winning chef, Nick Hodges, grew up in Falmouth and trained under Keith Floyd and Jean Christophe Novelli. He returned to Cornwall to run restaurants at St Michael’s, the Headland Hotel and the Rosevine, as well as teach at Jamie Oliver’s Fifteen Foundation, before taking up his new position at the Greenbank. 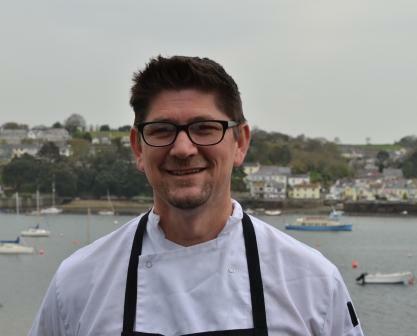 Hodges commented: “I’m from Falmouth and the Greenbank is special to me, it’s always been the dream to cook here and I wouldn’t work for any other hotel at this point in my career. Hodges’ arrival coincides with a complete overhaul of the restaurant interior. A new look by Dynargh Design blends booth seating and parquet flooring with a combination of nautical elements and art deco glamour to create an “elegant yet relaxed and comfortable dining space”.